DISDAOC. 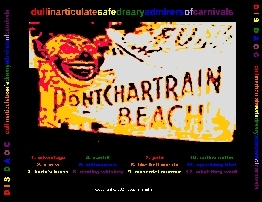 Dullinarticulatesafedrearyadmirersofcarnivals is the most recent release in the discography, available Memorial Day, 2001. Since the last CD release (Doc Hoo’s Creepy Covers, December 2000), there was a new addition to Peabody Sound. A second Tascam Portastudio 564 was acquired through EBAY, and plans were on the way for both machines to be synched together into digital minidisk 8-track. The first project to tackle that venture was The Uniform, Winter Studio Demo, 2001. While one machine was tracking 4 drum inputs, the other machine tracked 2 guitar, and 2 bass inputs. After a premix (8 tracks down to 2), an additional 6 tracks were assembled including vocals, guitars, tambourine, keyboard, and handclaps. The final mix was reviewed for production by Morphius Records. They signed up to the plan, but something terminal was discovered at the mastering plant – this final demo was so far out of phase, that it couldn’t be pressed to vinyl. The culprit? Manually synching the machine by hand, created permanent phase issues between live sounds recorded on both machines. For the production of DISDAOC, there would not be a remedy for this out-of-phase problem. Since the final product would not be pressed to vinyl anyway, production went ahead. If you play DISDAOC in mono, you can hear similar O-O-P issues. The other major additions to this recording was the use of a Boss DR-110 Dr. Rhythm “Silver Box” drum machine. The idea was to improve upon the rudimentary drum sounds from “Peaceship 2000 mui”. Also samples were used for the first time, taken straight from vinyl via a Denon turntable and Ortofon Cartridge. Some tracking was done with the use of an Alesis 3630 compressor. This was an 8 track recording, but what makes it different from the previous recordings, was that there was no pre-mix stage. 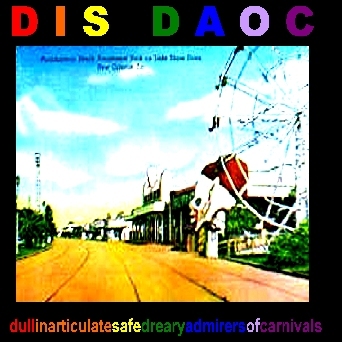 After listening to DISDAOC, it surely is the highest quality CD in the discography. However, beings that some information is out of phase, I’d encourage all to listen in as wide stereo as you can handle – maybe push your speakers a foot further apart if you can. The drum machine is an improvement over the prior CD’s, but it is limited to kick and snare programming, and overall are quiet in the mix. The cymbals are present in the high frequency range, giving the CD a more “techno” feel than in any other previous recordings. The keyboards are more expansive then “peaceship 2000 mui”, and there is an obvious attempt to simulate some of the early analog synthesizers from the 70’s. The bass is more blown out than ever before, a very “grungy” tone that is in high contrast to the drum machine. The guitars are wide open and angular, overcompressed through the use of an AKAI 2-track preamp. Very brittle, though more biting then in the earlier discography. A very aggressive attempt to distance it from the rest of the CD’s in this discography. This was all made possible through the use of the second four-track machine, where there is more space in the sound for the layering of all these instruments. The liner notes are high quality color Xerox, with a lyric sheet insert. Two of the 12 songs are readings of poems by the late Charles Bukowski, as is the CD’s title. The twelve songs clock in at just under one hour. "This starts out like another KimGirl record (Deal, Gordon)...then all of the sudden, comes this HashRock/Steely Dan mess...someone has run amuck with net clip art..."
"Wow, finally something by the shrimpguy that I can dance to...I dig "C M W", but I think 'The Monks' rip-off is too over the top..."
"When I thought all was lost, comes 'What They Want', the Buk opus that he wrote and re-wrote several times...why not once more?...a goddamn lit billboard, in the middle of hell." "Superb job...Dis Daoc lands in the prolonged 70's drawer, sampling Focus, Genesis, and Bowie....a bit of grunge wraps it all up...the 2nd Chinaski reading was better than the first"